Discover How You Can Improve Reliability And Reduce Manufacturing Costs! Martin Pickering has done the research for you. All you have to do is implement his techniques and you'll save money all the way. Your manufacturing costs will go down and so will your customer complaints as your product reliability improves. 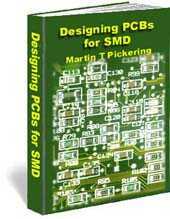 A lot has been written about Surface Mount Technology but it's difficult to find a definitive guide that teaches young designers about the essential considerations. Martin Pickering got his degree in Electronics Engineering in 1972 and has worked for various multinational manufacturing companies such as GEC Telecommunications, Siemens and Brother Industries. He worked his way through Development Engineer, Equipment Reliability Engineer, Quality Assurance Manager and Technical Manager so it's hard to question his experience. Why did nobody tell me about this at college? Why don't my fellow designers know all this stuff? I can't believe that I've been designing printed circuit boards for the last five years and made so many mistakes without anybody telling me! This book really explains the problems and what to do about them, without getting bogged down with complicated mathematics or technological gobbledegook. Martin just tells it like it is then lets the designer get on with his job. And my boss has promised me a pay rise because my latest design is actually saving the company money! Multilayer Ceramic Capacitors (MLCs) are known to be prone to failure under certain conditions. The manufacturers can check them in various ways, including use of the methanol test, but it's up to the designer to get the Printed Circuit Board right. It's up to the Purchasing department to ensure that the correct parts are ordered. The Goods Inwards inspection department should check that the parts meet the specifications. It's the responsibility of the Production Engineer to set the placement machines and soldering machines. Strangely, not all of this happens! People make mistakes and things go wrong. Worse still, management refuse to see that there's a problem! You feel as if you are banging your head against a wall. But, armed with the information in this eBook, you can become the expert. Convince management that the system needs a little adjustment. Get the design right; forget the "we've always done it this way" philosophy; make the changes; see the cost savings and improved reliability. How wide a copper track should be? The optimum spacing between tracks? How moisture affects printed circuit boards? What type of solder resist to use? What size solder pads should be? The significance of stress fractures? How the various soldering methods work? Why cleaning should be avoided? Why inspection and test are unreliable? Learn all this and more. See photographs of how tests were carried out on MLCs and the amazing results. Find out the secrets of design which nobody wants to publish. How MLCs can cause a fire simply by being run at 5 volts! Why you shouldn't use 47nF.